If any television show were to take four months to get off the ground, chances are likely that it wouldn't see out its first season. That is an unacceptably long time to force an audience to wait for something to actually get good. Thankfully for absolutely everyone, Star Trek: Year Four is not a television show. On a mission of cultural exchange to Viden, a planetary society organised entirely around television under the tyrannical rule of two competing monolithic networks, Kirk is suddenly thrust into the global spotlight after a public altercation with a network executive who shot and killed an eighteen-year-old actor in cold blood when he tried to to quit the sitcom he was starring in. Kirk, Spock and McCoy are arrested by Viden authorities (but not until after their faces are plastered all over the news, as the anchors sensationalize the incident to garner ratings) and try to effect escape, but instead wind up on The Doctor Marv Show, a daytime talk show ostensibly about solving people's personal problems where the host seems more interested in drumming up gossip he can use as a bit of cross-promotion with the tabloids. Because of their new celebrity status, the only way the crew can return to the Enterprise is to sign a legally binding contract selling one of the networks, the Trilateral Broadcasting Company, a TV show starring themselves, where either beach of contract or low ratings is an offense punishable by death. This is one of those stories that gets me so excited I can't even think straight. It is utter, utter genius on every single level: The conception, the visual symbolism in the framing of scenes, the general execution, the writing, the ramifications it holds for and the impact it has on the larger Star Trek franchise and universe-It's all absolutely brilliant. Even the artwork takes a noticeable uptick in quality from what we've come to expect from Year Four. The art here looks considerably more realistic and representationalist than what's been the norm for this series and, perhaps fittingly for a book about television that's part of a series that wants to be read as the lost fourth season for a TV show, there are a lot of moments in this story that feel like what we would call creative editing and cinematography were this an actual TV episode, but for which I can't think of an appropriate sequential art analog. 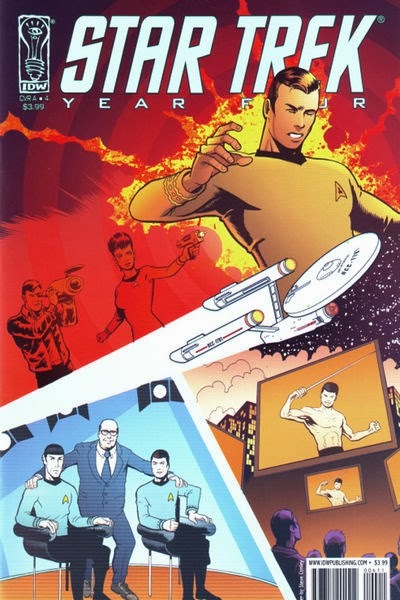 The best for me comes right after Kirk, Spock and McCoy find themselves on The Doctor Marv Show, where the titular TV doctor says “...And we're going to find out what these three friends like about each other and what drives them crazy-Right after this.” and the action immediately cuts to a different scene starting at the top of the next page. It's a masterful bit of layout and I can totally see it leading into an actual commercial break on the show. ...And his suspicions are immediately proven correct when it suddenly becomes apparent they haven't actually escaped and the whole thing was staged to give the Videns some scripted reality drama as Kirk, Spock and McCoy promptly find themselves on the set of The Doctor Marv Show, leading to that fantastic “cut”. It's at this point the book gets really interesting, though because it seems the reason the Trilateral Broadcasting Company wants the landing party to sell them a TV show is because their rival network is running its own science fiction show, a “derivative” series called Eden 3 about people from different species living on a space station trying to work together and they're hoping Kirk and his crew can come up with a better concept so Trilateral will have a competing product that will give them an edge in ratings. Now, Eden 3 is pretty obviously and transparently a shot at Babylon 5, but it's far from a cheap one and this proves to be extremely telling and important later on. But before that let's talk a bit about what Kirk attempts first, because it's amazing. Kirk has the whole crew beam down and casts them in a variety show, where each person comes onstage to perform a different signature act, leading to delightful scenes where Spock plays music by harmonizing water glasses, Sulu recreates the chasing-people-shirtless-while-brandishing-a-sword scene from “The Naked Time” and someone who to me looks a lot like Kevin Thomas Riley juggles colourful balls. There's even an absolutely perfect send-up of McCoy's “I'm a doctor, not a magician!” line as he says this storming offstage dressed as a literal stage magician with a top hat and tuxedo and everything while Nurse Chapel, who's playing his assistant, chases after him in a pink Vegas Showgirl outfit. See, what Kirk has done is respond to Viden's recursive artifice of television with a recursive artifice of his own, and this is his most meticulous and dizzyingly meta act to date: He's fighting television with its own primordial heart, namely, Vaudeville. But this isn't “Star Trek does Vaudeville” the way “I, Mudd” too often was, this is Kirk and his crew *playing the role* of Vaudevillians: In other words, they're performers playing the role of performers. Wonderfully, this still turns out to be too expensive for the network (which was of course Kirk's plan from the outset: Present them with an offer that, while costly, would be far more dangerous *not* to accept for fear the other side might get it instead), but Kirk has one more idea. And here's where this book goes from already brilliant to being one of the greatest Star Trek stories ever. Because Kirk's idea is to install cameras on the Enterprise to make a reality show about life aboard a starship, and the Videns find this *boring*. So much so that, two weeks in the ratings are in the toilet, the audience is complaining that nothing's happening and Kirk's show is facing cancellation, which of course would mean the destruction of the Enterprise and the death of everyone aboard (this time by bombs installed in the cameras that can be remotely detonated by the network executives, which is all kinds of perfect). This is a flawless scene to cap off a flawless book for a lot of different reasons. Firstly, this is a multilayered and nuanced exploration and critique of reality TV as a genre. “Reality TV” is a bit of a misleading catch-all term, as there are a lot of different genres of shows that fall under that banner. Just roughly, and off the top of my head, there are elimination competition shows (which already come in two different flavours, generally based on whether the elimination is handled by a judging panel or the audience itself), there are shows that might better be described as mini docudramas that wear their artifice on their sleeve and tell stories that come out of everyday life, but just have the contrast turned up, and then there are “scripted” reality shows. But there's yet another layer to this scene, and that line in particular, and it means a great deal to me because it's also very much about Star Trek, and is in fact a triumphant declaration of something almost unique to this franchise and one of the things that makes it worth saving. As I mentioned way back when we talked about it, the thing about Babylon 5 is that it was the United Nations in Space. It was an extension of the Hard sci-fi Space Opera that was one of the defining styles of the Golden Age (or at least Golden Age in the US) into the 1990s and was a big, epic myth arc about war and politics and patriotism and people in the halls of power doing other highly weighty and privileged things. And the reason it came up wanting when compared to Star Trek: Deep Space Nine, or at least Star Trek: Deep Space Nine as originally conceived, was because DS9 was supposed to be about ordinary people from all walks of life interacting in the working-class neighbourhood of a city in space. There is a chasmic gap between those two ideas. And, the largest complaint leveled against Star Trek: Deep Space Nine in its first two seasons was that it was boring and was like “watching unedited security cam footage”. This was also one of the primary factors involved in the decision to introduce the Dominion, the Defiant, Worf and that long, drawn out grimungritty War Arc that defined the back half of the show, and we all know how *that* turned out. But here, Kirk is agreeing with me: Ordinary life doesn't have exaggerated angst and 'splosions in it, but it's still valuable and worth examining. And *this*, ultimately, is what Kirk is defending, because a true “reality show” would be exactly what he creates: An unfiltered look at how people live. And sci-fi is really the genre for fiction writers to do this in, because the fantastic setting allows people to examine things about day-to-day life that would be difficult to do in a contemporary setting without risking misrepresenting people and worldviews the authors aren't intimately familiar with, not to mention any of the worrying voyeurism and privacy concerns such a setup in real life would raise. But the Videns are right too: Everyday life doesn't make good television, and it's not what people tune in week-to-week to see. What TV audiences want is a lot of conflict and character drama, and preferably very angsty interpersonal conflict and character drama that falls neatly into instinctively recognisable patterns of tropish writing (the same standards apply to your typical Nerd Culture genre fiction fan, but with the addition of the aforementioned 'splosions. And maybe some passive scantily clad waif-thin martial artist women getting rescued by the grizzled hero, who would preferably be very muscular, have stubble and speak entirely in snarky witticisms). So it really looks like, despite his best efforts, Kirk's show will be canceled by the network and he'll die with his ship and crew. But the Enterprise crew is prepared for this as well. Like Kirk says, “No-one threatens my ship. Not even the president of the network”. Scotty manages to disarm and remove all the camera-bombs, Kirk shuts down the uplink to Viden and the Enterprise can continue its journey unhindered. Not even cancellation is a threat to Star Trek now, because in this moment Star Trek transcends and rejects television. At this point I don't care if this story could have been done in 1970 or not (and given some of the postmodernist tricks it relies on and how much it's indebted to early 21st Century television a case could be made it couldn't have) and nor do I even care how good or bad the rest of Year Four is. This is a story that needed to be told regardless of era, and it could only be told on the Original Series, and, really, only on Year Four. Certainly in terms of performativity this story belongs to this crew: While both Star Trek: The Next Generation and Star Trek: Deep Space Nine had their own kind of performativity, neither of them had *William Shatner's* kind performativity, and that's what really makes this story: It's the next logical step from “Bread and Circuses” (hell, it's “Bread and Circuses” done *right*), “A Piece of the Action” and “Spectre of the Gun”: This is a story about Star Trek going beyond playing with its own artifice and performativity and taking on television itself. But more importantly, this is a story about extending a friendly hand from the beginning of Star Trek's history to its legacy via the present. This isn't just a defense of Star Trek or an explanation of why Star Trek is debatably better than Babylon 5: It's a defense, and acceptance, of my Star Trek. And, because of that, it's a defense and acceptance of all Star *Treks*. It's a rejection of the concept of the definitive Star Trek coming at a time when we're not too far away from J.J. Abrams, Roberto Orci and Alex Kurtzmann making a firm claim about what the definitive Star Trek should be. Only the Original Series could do this because only the Original Series has the cultural capital and gravity to do so. And only Year Four could tell this story, because only Year Four has the hindsight and positionality to pull it off. And before we go, we get one last parting shot: An upstart Viden screenwriter tosses a script onto the desk of Trilateral's president, hoping to pitch his new science fiction show. The name? “Starfleet Academy”. Recall that in 2007 there was still the widespread belief that oft-rumoured reboot movie would be about Kirk and Spock at the Academy: Not only will Star Trek live on without television, it'll live on independently of whatever new Soda Pop Art gets made *in its name*. Star Trek is, by this point, simply too ubiquitous and alive to be beholden and subservient to the forces of late-stage capitalistic media production. Because this is an idea too good to let die or allow to be commandeered by one party. It's a neverending faith in peace and optimism that belongs to both everyone and no-one. Forget being better than Babylon 5 or scripted reality shows. Star Trek is better than television. Well, now I've got to track this down. And while I won't knock the medium, as an avid comic and sequential art reader and critic, I'll say it simultaneously joys me to be a story so perfectly suited for its medium, while at the same time making me wish I could've seen the actors tackle it in 1970 with all the fervor, drag and glee that they would have brought to it. That's no knock, though - for a comic writer and an artist to be able to capture it so perfectly that I consider it a shame never to be able to see it done live, is pretty high praise. It sounds as if it was designed for Shatner and the rest, and contextually even with the hindsight afforded it about TOS, and the retrospective glance at the DS9/Babylon 5 contrast, it would've been the perfect "Final Episode" of the Original Series. I'd be forever endeared to one of the Star Trek fan productions if they'd adapt it. Oh man! This just flat-out sounds like THE best Star Trek story idea ever! I had given up on this series of comics being any good - I am a graphic novel fan, but pretty choosy - as with K.Jones above I need to go hunt this down. I don't have much else to add but *wow* and the fact that I am so surprised to hear about such a quality story just popping up in a below par range. I'm not going to get cheeky and pretend I was saving this as some kind of trump card to pull just as everyone was getting sick of this series. I did *not* expect Year Four to casually toss out a story of this calibre. I chose this miniseries specifically *because* I thought it was pointless and mediocre and, well, the rest of it is, but that just makes this issue all the more incredible. Just goes to show that you can find hidden gems anywhere if you look. Makes it a really worthwhile experience a journey like this then when you can accidentally find buried treasure - all the more satisfying when it's unplanned.